My daughter just turned 12 and has started liking fashion and a little bit of makeup (and I do mean little!) She also is very creative, crafty and loves working on DIY projects. 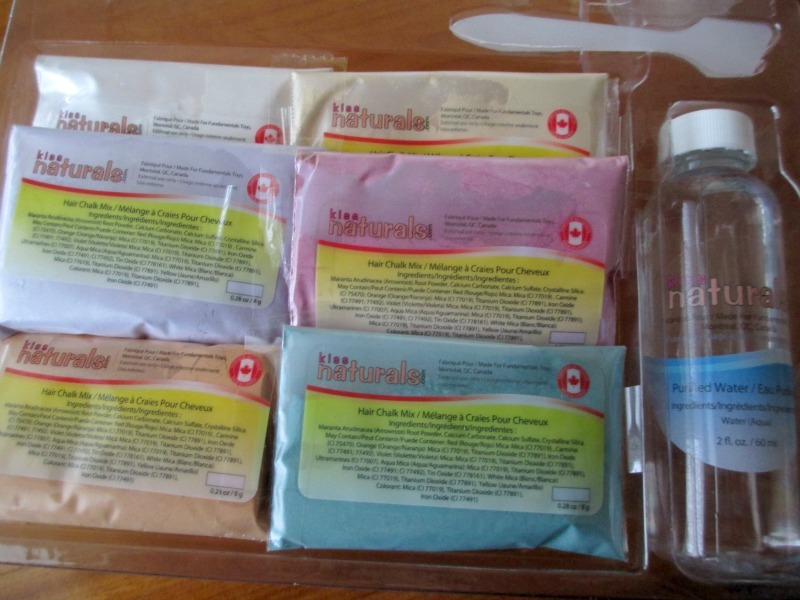 When I got the change to review DIY natural kits from Kiss Natural, I knew she would love it. 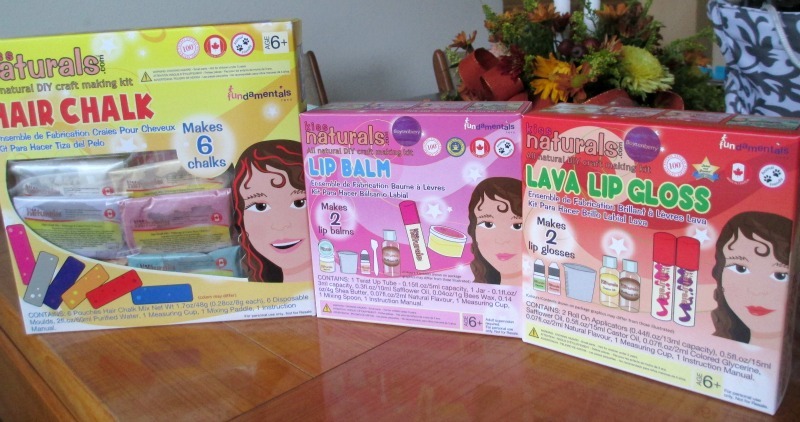 Kiss Natural kits allow kids to create their own lip glosses, hair chalk, soaps and more, using high quality natural ingredients. No fillers, additives, dyes or synthetics in any of their products. No one wants their kids using products with nasty chemicals so knowing that this kits are all natural is a HUGE plus in my book! The first kit we got is the Hair Chalk Kit. With this kit, you can make 6 hair chalks. These hair chalks are fun to make and let your daughter add some color to your hair but it washes out very easily. The hair chalks are colored with mica, which is a safe & natural mineral to use. The big kit comes with 6 x ½ oz chalk base, 1 mold, 1 x 60 ml witch hazel, dropper and a mixing cup. The mini lip balm kit lets you make two different lip balms. This kit comes with 1 jar, 1 twist up tube, safflower oil, beeswax, shea butter, orange and grapefruit essential oils. 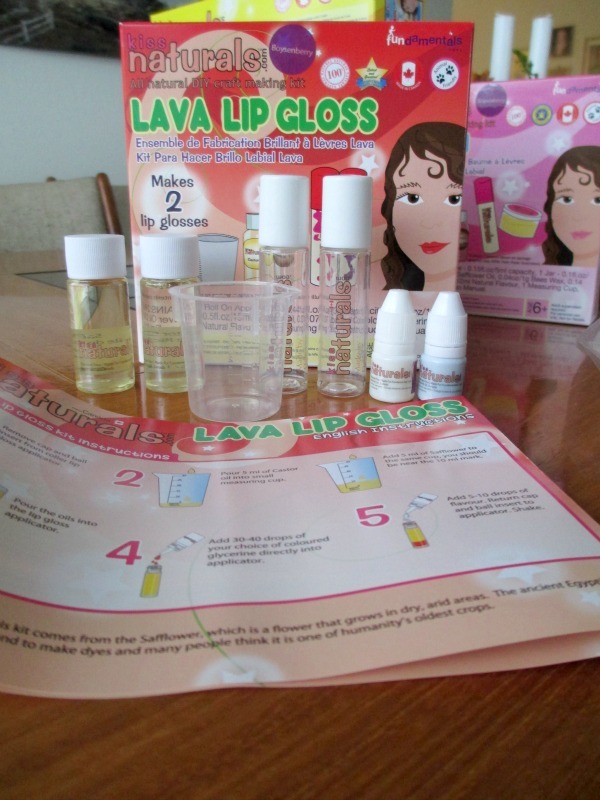 The mini lava lip gloss kit is another fun kit that any girl will love. The mini kit makes 2 lip glosses that produce a unique lava lamp effect. You’ll love its shine and bubbling swirls of color. Included in the kit is safflower oil, castor oil, colored glycerines, essential oils, and roll-on containers. I would buy the Lava lip gloss. This is such a great idea for my nieces. They can make their own gifts to give to friends. The Lip Balm would be my first choice because we use it all year round here so I know we would love trying to make it. I would get the Lava Lip Balm from Kiss Naturals. I like the bath fizzies set. i really like the lava lip gloss they have on the site ! !